My Friends Christian Child Care & Preschool is a nationally accredited licensed Family Child Care for children ages 16 months-6 years. My Friends is located in Bloomington Minnesota, the largest Twin Cities’ suburb – just three minutes from the Mall of America. Right in the middle of the block, surrounded by houses and fences, children chase butterflies and revel in the squishing of mud. Natalie Marose has been an early childhood educator for many years. In 2011 she moved from classroom teaching and school administration back to Family Child Care when a house became available for her to use specifically for child care and preschool. With her strong background and experience in early childhood education, and passion for providing the best for young children, creating a Nature Explore Classroom was a perfect addition to her program. My Friends is built on the philosophy that supports each child’s development; physically, cognitively, socially, emotionally, creatively, and spiritually. The world, their senses, and curiosity come alive for children when they touch and feel the bark on an old giant maple tree, the side of a birch tree, the softness of an arborvitae, and the prickliness of white spruce. Running full force, jumping as high and far as possible, and climbing to new heights give children the opportunity to push their limits and conquer new challenges every day. Building with natural materials, hauling heavy logs from one place to another, and daydreaming as clouds float by overhead ground children. Even painting at the easel and reading books with the fresh rush of a breeze, stimulate creativity and enhance skill development. 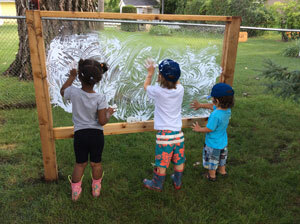 The changing seasons in Minnesota give children something new to discover each time they enter My Friends’ Nature Explore Classroom. The children delight in observing worms, beetles, spiders, ants, toads, birds, and squirrels. The cycle of falling leaves-colored and crunchy, snow-sticky, heavy, sparkly or fluffy, new leaves on trees and bushes, and lush grass are all observed close up – in real time. The children plant seeds, care for seedlings, and harvest garden vegetables. Caterpillars wiggle in their hands, wrap in a cocoon and eventually emerge as a marvelous moth. Cicadas leave their exuviae on trees and fence posts, they molt right before the children’s eyes, and in a fairly short time, zip off towards the tree tops. Natalie and her husband, Dan, spent many months planning the outdoor classroom layout. Thanks to Dan’s vision and craftsmanship, a suburban backyard was beautifully transformed into My Friends’ Nature Explore Classroom. Natalie says, “I dream it, he does it.” Dan’s seemingly unending talent, patience, and understanding of Natalie and her goals for My Friends make it all possible.